A prime CMK site that has stood empty for over a decade may finally be ready to come back to life. 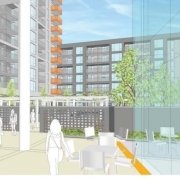 Plans by local developer Abbeygate have been released that would develop the former Wyevale Garden Centre, which closed in 2007, with a new private rental sector (PRS) scheme delivering 328 apartments. The buildings would range from 3 to 12 stories in height, with the tallest part facing the junction of Secklow Gate and Avebury Boulevard and the lowest, at 3 stories, facing the existing homes on South Tenth Street. The two L-shaped blocks are set around a central garden, with space for businesses such as shops and restaurants on the ground floor along Avebury Boulevard. 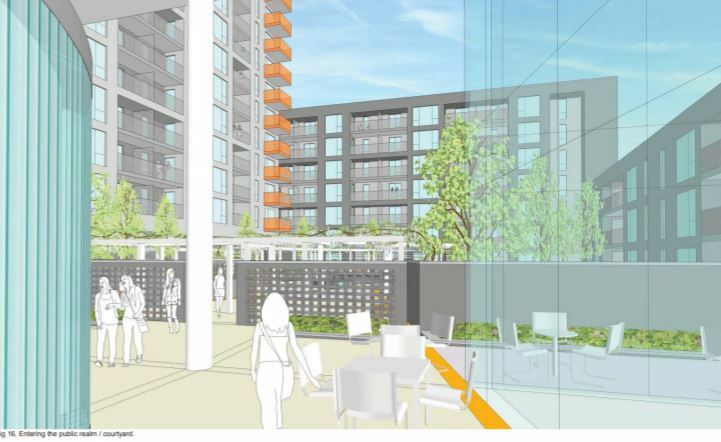 Although the scheme is similar in many respects to Abbeygate’s earlier development at Vizion, above Sainsbury’s, the central garden in this plan will be visible from the street and the development will not involve building over any of CMK’s streets, footpaths or parking areas. The Town Council has submitted a response to the application which welcomes many of its features but expresses concerns over the level of parking provided. We have also sought assurances that servicing and refuse collection arrangements will not affect existing residents on South Tenth Street. This cannot go ahead. The original ethos of Milton Keynes was to have no building taller than the tallest tree I.e. no taller than 3 stories. If this gets permission it will set a dangerous president for any future planning applications.